Sunset Crater Volcano is a small national monument, 2 by 2.5 miles in size, so hiking opportunities are limited and there are only two official trails, Lava Flow (1 mile, loop) and Lenox Crater (0.5 miles), and while cross-country exploration is allowed in some places, much of the area is covered by jagged, unstable lava. But there is one longer path in the vicinity, climbing nearly 2,000 feet to the summit of O'Leary Peak, an ancient lava dome volcano just north of the monument. The trail starts close to the western entrance station, runs right by the edge of the Bonito Lava Flow for a short distance, briefly entering the preserve, then rises steadily across sparsely wooded slopes to the summit, site of an active fire lookout tower. The panorama from the top takes in a large swathe of northern Arizona including the San Francisco Peaks to the west, the distant Kaibab Plateau to the north, the Painted Desert to the northeast, and the Mogollon Rim to the south. The summit also provides a good perspective of the reddish cone of Sunset Crater, 3 miles south - an elevated view not possible anywhere within the monument. Very few people walk the path however, partly as it is not signposted from the main road, and partly as the route is relatively long and some sections are somewhat monotonous; the hike is along a vehicle track, hence the gradient is shallower and the course less direct than if it were solely a foot trail. Much of the surface is made of loose, coarse black ash, making the walk more tiring than might be expected. The volcano is named after Daniel O'Leary, originally from Ireland, who explored this area in the late 1800s. Topographic map of the O'Leary Peak Trail. 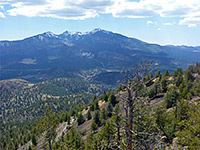 17 views along the O'Leary Peak Trail. 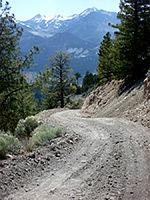 The track leading to O'Leary Peak forks off the main road (Hwy 395) just west of the national monument entrance, and is signed only to the USFS O'Leary group campground, which is reached by a short spur on the left. Just after this junction, the track becomes unpaved and is blocked by a gate - parking for the hike is adjacent, and there is space for about six vehicles. The surroundings are wooded, a mix of large ponderosa pines and a few white-barked aspen, all quite well spaced, growing from a mostly unvegetated layer of black ash. A notice has a trail description, route map, and a list of various regulations including no camping, no woodcutting and no off-roading. 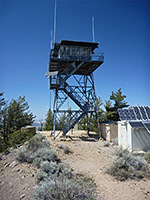 The surface of the track is made of the same loose ash as the surroundings, so a 4WD vehicle would be needed, but the only people permitted to drive are forest service employees and staff working at the lookout tower. The road slopes down slightly to the Bonito Lava Flow, at the edge of which the rocks are greenish grey due to a covering of lichen, but pure black beyond. The lava rises up to 50 feet above the surroundings, and the big, jagged, blocky piles make an abrupt contrast with the smooth, even ash deposits beneath. The track enters the national monument for two short stretches, marked by a fence and NPS notices, then moves away to the north, starting to climb. The route bends right at the junction with a disused and barely recognizable side track, thereafter becoming temporarily level, aiming for Darton Dome, a subsidiary peak. The ground is soon rising again as the track starts the first of three long switchbacks, through woodland that is now noticeably less dense, so the views are better. Another bend is followed by the longest straight, ascending 500 feet over 1.1 miles to a forested saddle linking Darton Dome to the main peak. This gives the first views of the flat desert to the northeast. 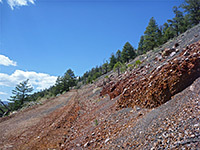 The next straight is shorter, passing through a bright/red purple outcrop at one point, surrounded by the usual black ash, though the ash soon gives way to solid, grey brown rocks (andesite) that persist the remainder of the way to the summit. 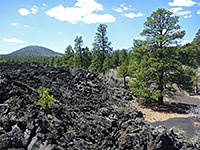 Most of the mountain is composed of andesite; the ash that covers the lower slopes was deposited by the Sunset Crater eruption of around 1065 AD. The trees are now well separated, much less tall than those lower down. The track reaches another saddle between the two summits of the peak - the actual high point (8,938 feet) is a short distance west, but the lookout tower is 22 feet lower, on the eastern summit. 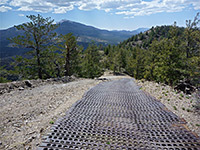 The final section of the track is steep and crosses loose ground so 150 feet of iron mesh has been installed to assist vehicles. A few trees grow on the rocky ground beneath the lookout tower so there is no 360 degree panorama from a single point, but gaps in the trees do allow views in all directions. Vistitors are not generally allowed in the tower, but when occupied, the resident ranger may invite people up.